Over winter break, the William Jewell College Pryor Leadership Program Fellows set out on their Outward Bound trip to the Florida Everglades. They packed their bags, printed their boarding passes and prepared to put their leadership and team bonding skills to the test. The Pryor Leadership Program is a three-year program that aims to develop leadership skills in individuals through experiences in the classroom and through vocational and volunteer internships. Participating in an Outward Bound trip is an integral part of the Pryor Leadership Program.The trip allows Pryor Fellows to utilize the leadership skills they learned in their first Cornerstone Course, while also demonstrating their strengths and weaknesses in trying conditions. 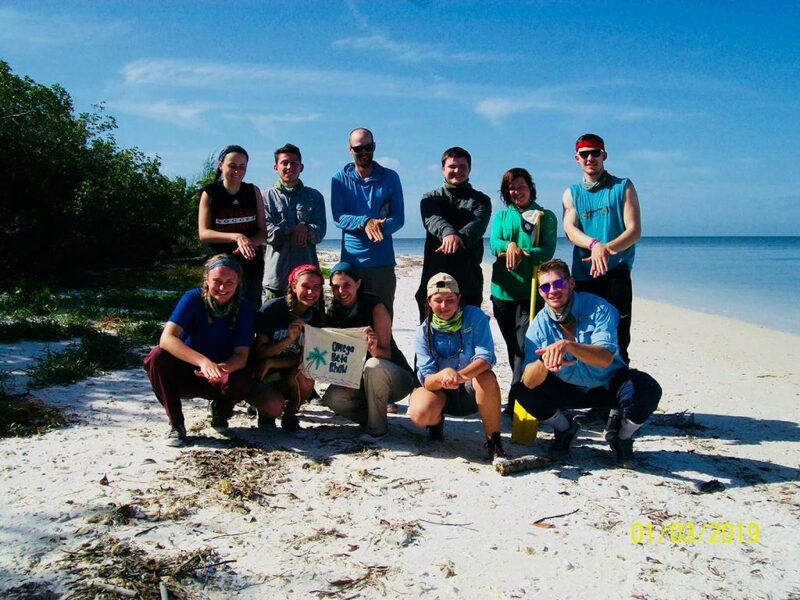 The Fellows are tasked with paddling across the Florida Everglades, including having to navigate through mud and mangrove trees, without access to common technology. 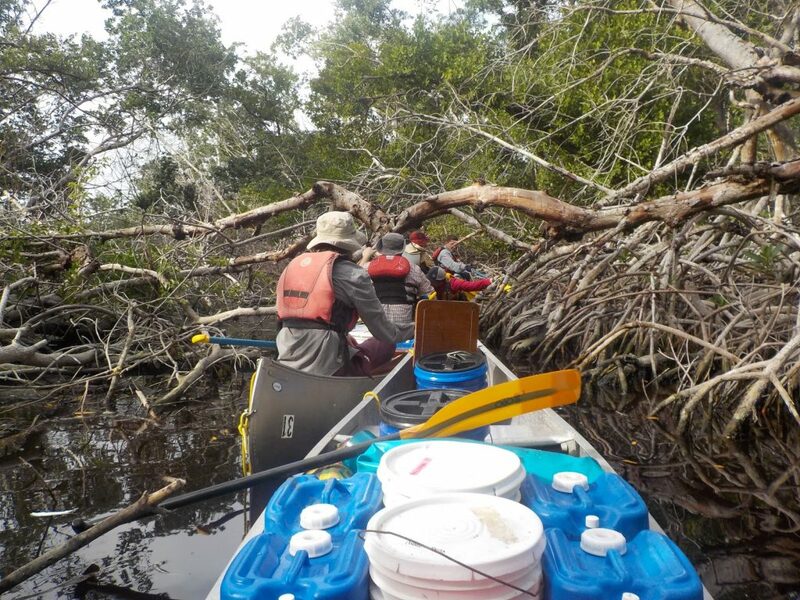 A crew working together to navigate through an area of mangrove trees. Photo courtesy of Carman Stephenson. “The trip was amazing. It was a roller coaster of emotions but I wouldn’t change a thing. This is by far one of the most amazing trips I’ve ever taken for both the growth of myself as a person and for all of the amazing sights you get to experience. This trip has given me a newfound love for nature and all it has to offer,” said Carman Stephenson, sophomore elementary education major. Will Schneider, sophomore political science major and another Pryor Fellow who went on the trip, agreed that it was a life-changing adventure. “Overall it was an amazing experience. I was very lucky to have the group I did, we all seemed to bring something different to the table. Everyday there was a challenge and one of us stepped up and was exactly what the group needed to keep us paddling forward,” said Schneider. “I learned a lot about my personal physical strengths and my mental strengths. Since we were rowing for almost two weeks straight, it took a lot of physical commitment and strength to get our group to where we needed to be each night. Overall, I think I gained a lot of perspective, on what I have to offer the world and then just to cherish certain luxuries at home because it’s not a normal thing to have them,” said Sydney Bass, sophomore English and Spanish major. All of the Pryor Fellows can agree that throughout the experience, their bodies and emotions were tested as they encountered challenges and obstacles in their path. However, these challenges provided a chance to come up with solutions and to problem solve with one another. “I grew so much throughout this experience. You are pushed to your limits physically, mentally, and emotionally – which can show you a lot about yourself. I learned that I am definitely capable of more than I thought!” said Stephenson. Having to change one’s regular routine can be quite an adjustment and presents many difficulties in new places and environments. The Fellows had to find ways to develop resilience to these difficulties throughout the trip. “It’s sort of like you go through withdrawal – from foods that you’re used to eating, from knowing the time every second of the day, from people that you depend on, and really just from typical life. But after those couple first days it was amazing, because the worries of drama on the internet or the millions of homework assignments sort of dissipate and I was able to really enjoy the pure nature around me and the really cool people I got to meet,” said Bass. Stephenson agreed that the change of environment was a challenge for her. “I would say that the most difficult part of the trip was being pushed so far out of my comfort zone. You are thrown into a new environment, with a new group of people, and taught a new set of skills all over the course of two weeks. I never found myself comfortable on this trip which is both the best and the worst part,” said Stephenson. 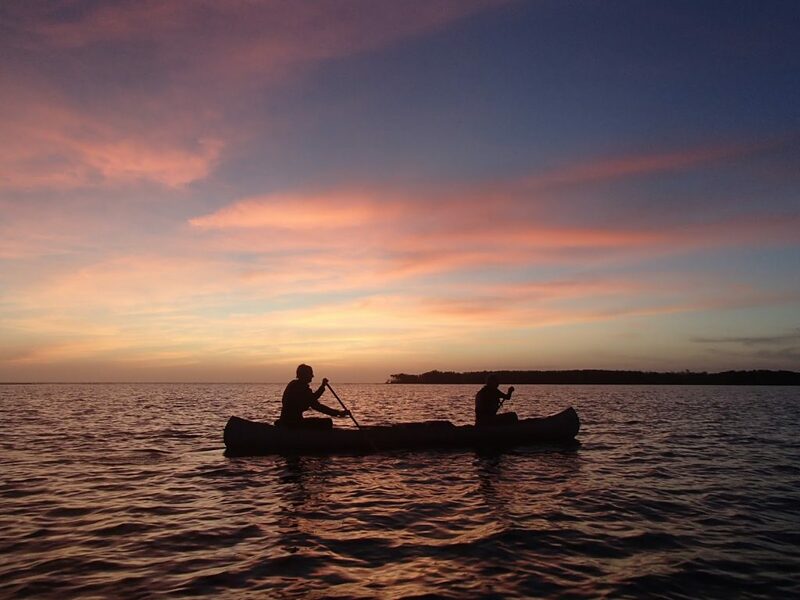 Pryor Fellows paddle as the sun sets behind them. The sense of accomplishment that each crew received when they reached their final destinations made all of the challenges they experienced worthwhile. “The most rewarding parts of the trip were seeing a beautiful sunrise and sunset everyday. They were always something that the group would stop whatever we were doing and just watch. Then the final day of paddling we all raced to the end and when we got there the feeling of accomplishment was a very rewarding feeling because of how hard our group had worked,” said Schneider. Stephenson also agreed that making it to their final destination was, for her, the most rewarding part of the trip. “I can easily say that making it to the endpoint was the most rewarding part of the trip and one of the most rewarding moments of my life. Once you make it to the end you are worn out and tired but you can also be so proud of all you and your crew achieved. It was an amazing feeling to accomplish such a difficult task with a group of people that you truly grow to love and rely on,” said Stephenson. The skills of the Pryor Fellows were tested, but by working together and staying positive they were able to lead their crews through the wetlands of the Everglades.